Grails note to future self: domain object String are assumed to be not nullable. Plus, .save() with failed validation returns false but does not throw an exception. LOL, this is turning into a liveblog. Had some frustration because I assumed setting "many" members of a one to many relation, and then saving the parent object, would save the members. NOPE! That as JSON is pretty sweet, and a nice way to shove stuff into JQuery land. YAARGH... if you're not doing things the right way and putting stuff in services and transactions and what not, DON'T FORGET TO FLUSH. I burnt like a super frustrating hour on this. More late hour mistakes: unlike some similar systems, Grails isn't smart enough to say that a parameter coming in as the string "false" is actually boolean false. OK, that was fun. By fun, I mean intensely frustrating at times, but with success at the end. Probably my biggest rookie mistake was having my Grails controllers manipulate domain objects directly rather than using Services - which also would have helped me construct some better tests. It's worth me reflecting on unit tests at that point. I write tons of ad-hoc, test-ish things when I'm developing, I tend to code in almost absurdly small tests and make sure what I just wrote works before moving on. But I guess each one is a proof to myself that I am using the system correctly... so when the part it's working on works, I throw the ad hoc test bit away. In general, I don't intuitively feel the value of preserving the ad hoc test by elevating it into a proper unit test; if what it's testing fails, that seems like a really fundamental problem in the underlying plumbing! I have more of a knack for component and integration tests. A lot of smart people emphasize unit tests, and while they still feel "too small" to be useful to me (and also much more likely to be confirm implementation than functionality) I want to better internalize the instinct for them. Here's a pretty good page: What I wish I knew about Grails before my first Grails Project. 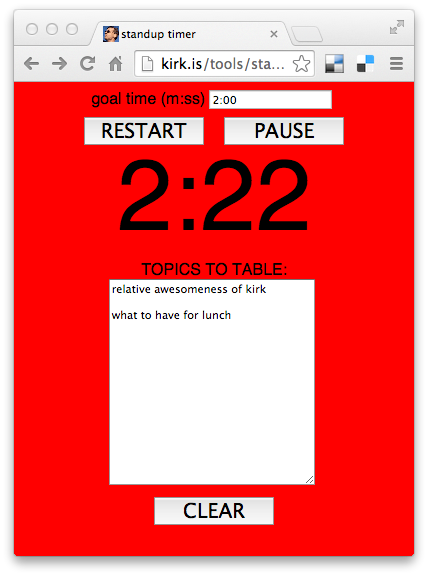 Doing a hackathon project in Grails, partially as a learning exercise. Man, it's so slow using a new environment, even one meant to be lightweight and fast like Grails! which according to this SO page (probably where I got this snippet at first) is already on the Grails classpath. Excellent! I kind of wish I knew an easy way to extend that to multiple entries, like with a tag system. 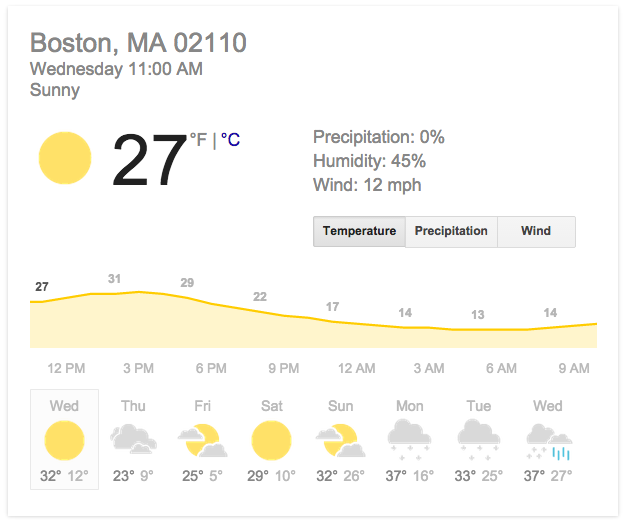 For obvious reasons, Bostonians have been EXTREMELY INTERESTED in the weather as of late. It has been a heck of a season here in "Hothworld". There's a plethora of apps and sites out there to tell you the forecast for the next 5-10 days, but few that hit a sweet spot of conciseness and detail. Some take very wordy approaches, like the local TV news weatherman, and go on and on about fronts and pressure systems and what not. It's can be nerdily interesting, sure, but a bit much when you're just trying to make plans for the next few days. Others, like the default iOS weather app, undershoot: each day is represented by a single weather type icon (sun, snowflake, cloud) and two numbers (expected high and low). That's not enough info! There's such a difference between a sprinkle and a deluge, or some light snow flurries and the kind of blizzards Boston has been enjoying, but you don't know what to look out for with such a simplified display. Wind speed and direction aren't often useful to me personally, but it's easy enough to ignore that bottom part, and I imagine very interesting for some regions and/or activities. (The arrows embedded on the line itself help distinguish it from the other two lines. Similarly, red is a good choice for a temperature line, because of the semantic association with heat. It takes up about the same amount of screen real estate, but tells you so much less at a glance. There's no whole day precipitation estimate. Much of the same hour-by-hour temperature / precipitation / wind are there as well, but you have to click for it, you can't get it all at once. I admit Google's is prettier, and has that nice sense of breathable white space, and so some might prefer it. 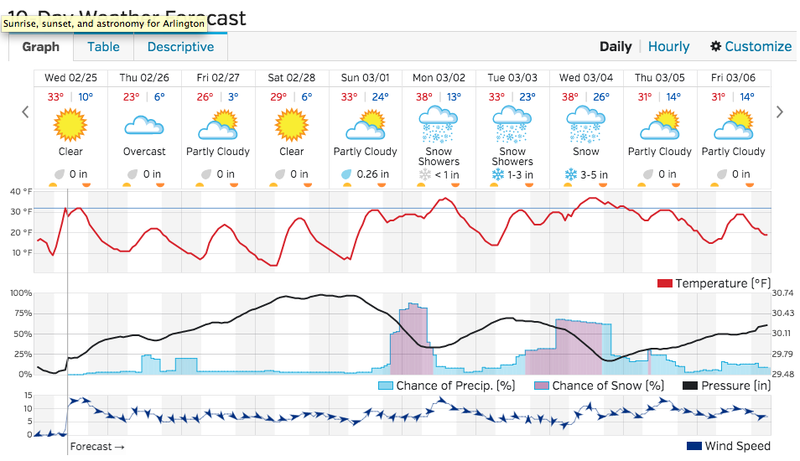 Overall though, I'm smitten with wunderground allowing me to absorb the story of a week at a glance, and wish more apps would give the total precipitation estimations. PROBLEM: In our retrospective, it was brought up that sometimes the daily standup meeting drags, in part because we get too focused on a ticket, solving-problems, etc. 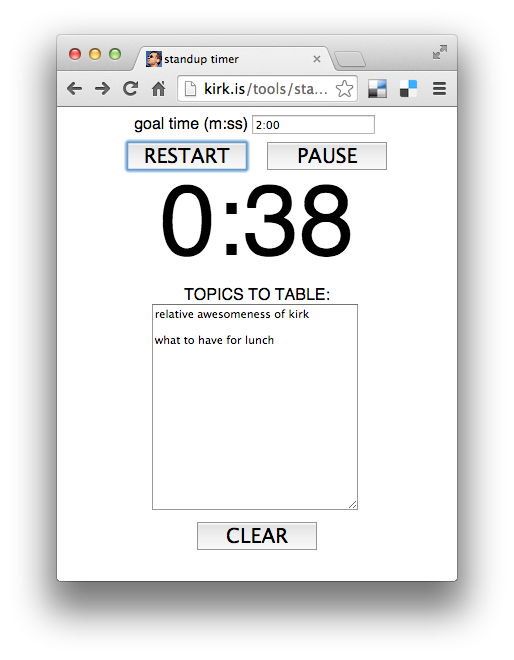 (PARTIAL) SOLUTION: http://kirk.is/tools/standuptimer/ , a trivial webapp (on the same shared desktop screen) with a simple stopwatch to quietly keep track of time elapsed and a notepad to jot down what should be tabled and discussed at the end of the stand up. When the elapsed time is greater than the goal time, it simply changes to red - enforcement is still up to the team. I also thought localStorage was about the right level of persistence for the goal time and table'd item textarea; enough to be lightly persistent, but no worries about the server grabbing information. I was thinking about making a gong play or something when time was elapsed, but it just seemed like would be distracting. I do dig being able to whip up things like this in short order. I could do that! 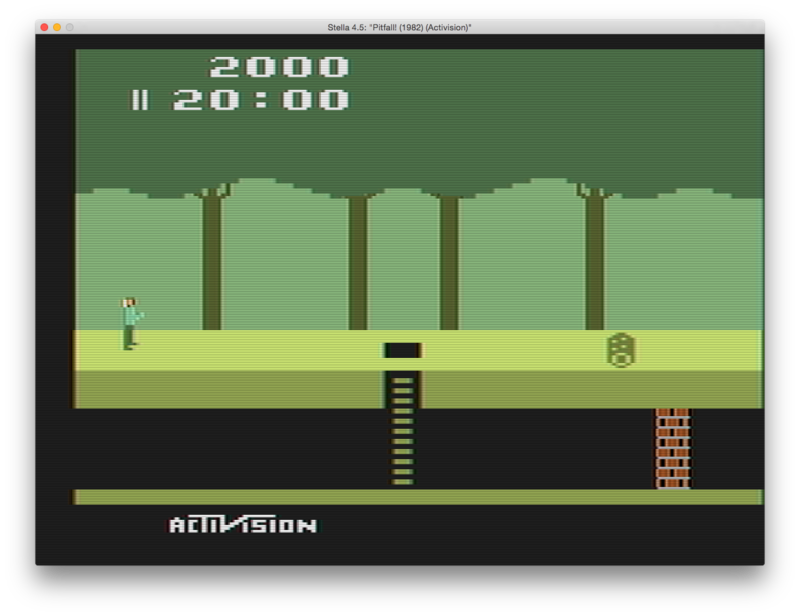 I'd made an Atari 2600 game before! And thanks to a kind of amazing creation called batari Basic I thought it might even be doable over a weekend, instead of a year and a half. 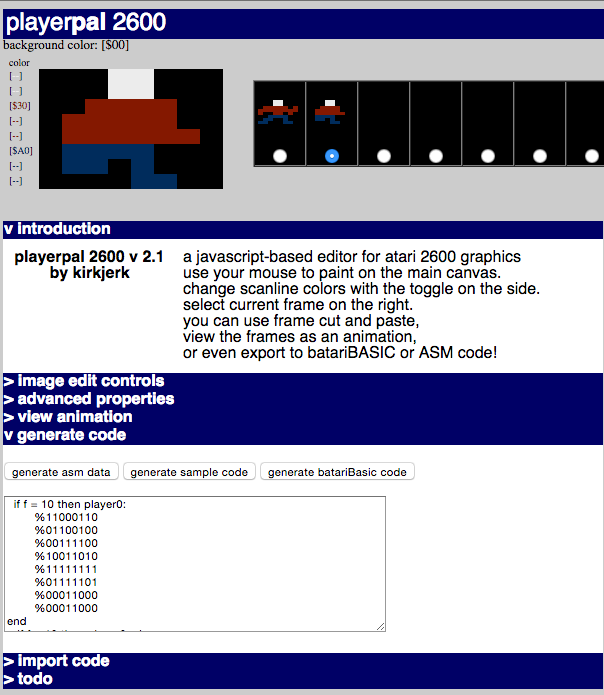 Batari Basic is a genius, enabling tool for the creation of Atari 2600 games; it lets you code game logic in something like good ol' BASIC (and then formally compiles that into assembly language, rather than being interpreted) but more importantly it takes care of the all important, super-difficult display kernel. It also uses some of the precious Atari 128-bytes-of-RAM to store a big, clunky playfield that can be manipulated on the fly. In short, it's one of those homebrew things I never would have thought possible until Fred "Batari" Quimby came and did it. I pitched a vague idea for an Atari game (something about 2 players indirectly fighting each other, maybe by pushing blocks around - initial game proposals are notoriously disconnected from final results at Game Jams) and attracted a small team consisting of me, Oliver Getz on music, and Winnie Gong for art. It was pretty touch & go the first night; I tried to get a development environment going, just to make sure that what I was proposing was even feasible. I was an early proponent of batari Basic in 2005, and even created its first homepage, but it had been years since I've played with it, and in the years since I'd switch to Mac, so that was another known risk factor. The first step was getting an emulator going to play any results on: Stella (go to Downloads | Stable Releases on the sidebar) seems to be the default choice. See? It's too pure, too clean! which produced zombie_chase.bas.bin, and I could play that in Stella. 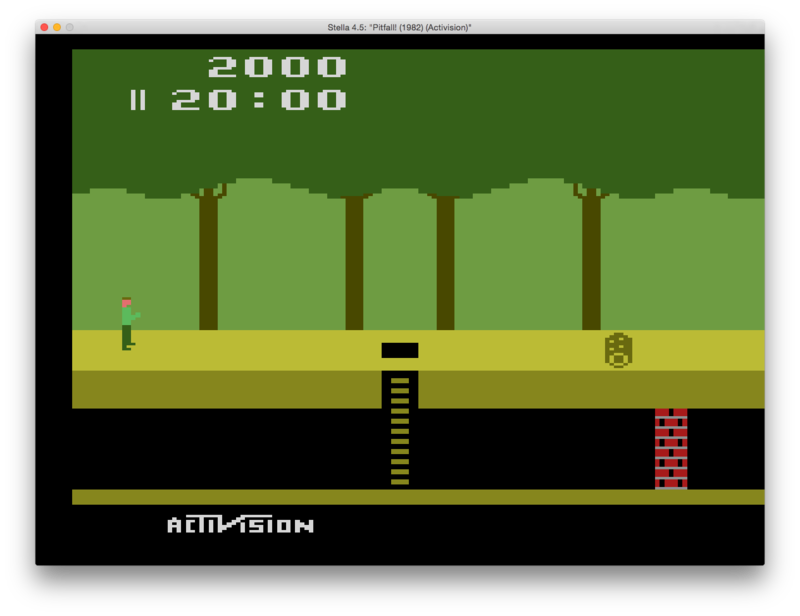 Once I had proved I could make Atari programs on the Mac, I wanted to make sure I could set up Oliver to do his music thing; he was enthusiastic about learning about and working within the constraints of the system's sounds. Years ago I had made the page do re bB: the BASICS of batari music that provides an overview of the theory and practice of the beast, and includes webTune2600, an HTML front end I had made to a command line program that would find the "nearest hit" note sounds for Western music so I was able to point him to that. The semi-canonical reference for the language is the GIANT batari Basic Commands page, kept up to date by "Random Terrain". This page is... kind of overwhelming. It's so much information, and not always put together in a way a newbie might find intuitive (I've been collaborating with RT to help smooth out some of the rough edges.) Still, I was able to piece together stuff I had forgotten along with new stuff that had been added. The game evolved organically from this point, based on what seemed fun with what batari Basic made easy. It's very good at shoving the Playfield Pixels around (big blocks on the screen, vs the smaller playfield graphics), and so one early thing I tried was having the blocks move the opposite way than the main character (which turned into a bear, for no reason better than that's what emerged when I started playing with playerPal 2600) Even without having the playfield blocking movement or shots, it added a kind of pleasing, noisy "camouflage" aspect to things. I added a second player and had them start shooting at each other - not such an original choice, but promisingly reliable for the game jam. 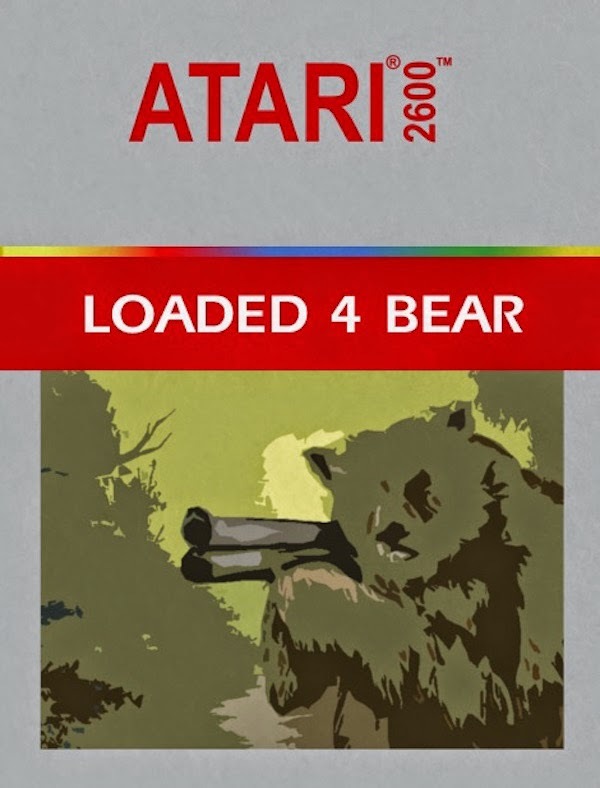 Anyway, a new Atari game in a weekend! Its been nice getting back into the scene a little bit, and maybe I'll get some more Atari work in before the year is out. Last year I was doing some SQL log spelunking, and was getting frustrated when I wanted to rerun a query iBATIS had generated for me... it was generating SQL with great big heaps of parameters, but putting the actual injected parameters on a different line of the log, and merging the two was frustrating and error-prone. select * from user where firstname = ? and lastname = ? which can actually be copy and pasted into MySQL Workbench or wherever, and modified, and the results inspected. Primitive, not super-robust, but useful! Coworkers were asking about its location today, and so I thought it deserved its own devblog entry. I enjoy being able to craft and host simple tools such as this. Jack L Moore's autoresize for textareas is pretty hip! 1. 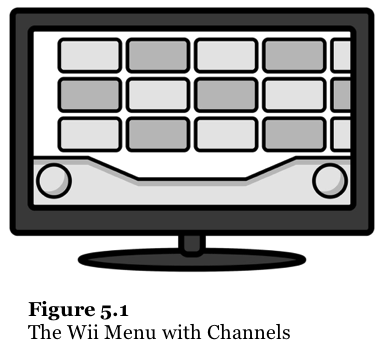 The book goes into some detail about the main menu of the Wii, how it was meant to be friendly and employed the idea of television-esque "channels" (which extends the a metaphor of the living room placement of the Wii, also echo'd in the use of "remotes" as the primary control.) One particularly unfriendly aspect of this menu is that you can ONLY select a channel by using the Wiimote in its "laser pointer" mode - and therefore have to have the sensor bar set up and well-positioned, a Wiimote ready to go with battery, etc. It would have been fairly trivial to allow, say, a Gamecube controller, or even the Wiimote D-pad, to select a game, but they elected not to do that. 3. 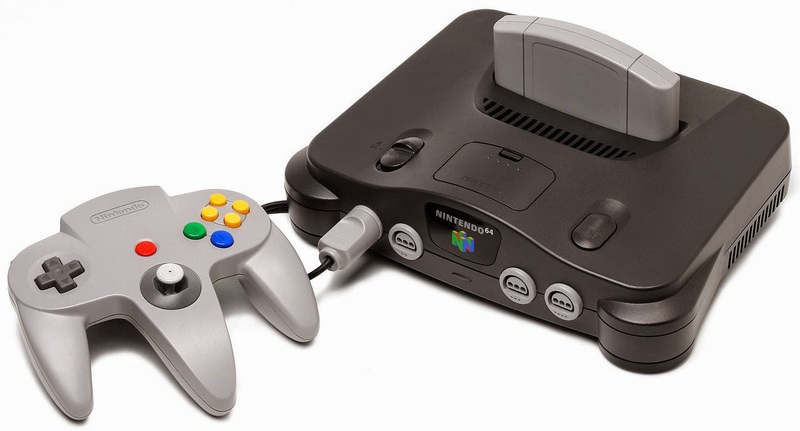 While the GameCube gets some attention in the book I would have loved to see more mention of the Nintendo 64; in particular, when discussing Nintendo's philosophy about games as a social space, this device having 4 controller ports was very forward thinking. (And of course, the much-maligned 3-pronged controller pushed the envelope as well by introducing/popularizing an analog thumb-stick, and then later things like the rumble pack.) Personally, I'll always hold a small grudge against Sony for having the industry-leading PS2 only support 4 players with use of a separate device, and thus less support from game developers. Overall the book is a fine read.